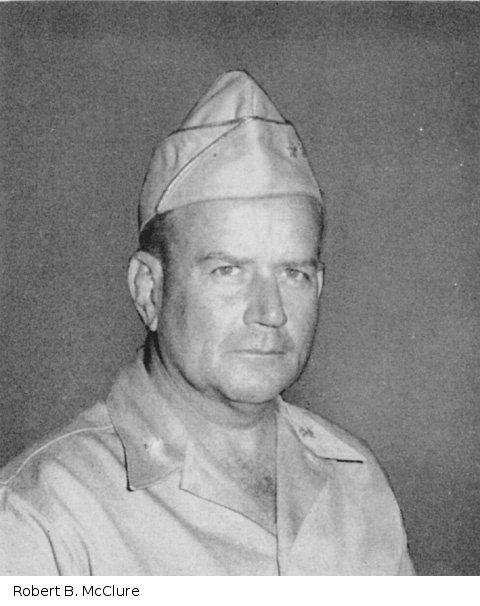 The Pacific War Online Encyclopedia: McClure, Robert B. Table of Contents Next: McCormick, Lynde D.
McClure commanded 35 Regiment during the battle of the Gifu strongpoint on Guadalcanal, relieving one of his battalion commanders after the third failure to break into the strongpoint. He subsequently commanded Northern Landing Force, built around 35 Regimental Combat Team of 25 Division and 4 Marine Defense Battalion, in its landing on Vella Lavella in August 1943. McClure praised 4 Marine Defense Battalion but complained that the lack of landing craft prevented his force from quickly annihilating the Japanese defenders. McClure took command of Americal Division when Hodge was promoted to corps command. 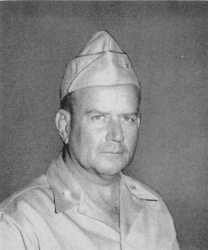 McClure was subsequently was transferred to China, where he advocated giving American advisors so much authority that they were effectively be in command of the units they advised. McClure himself was the chief advisor to Ho Ying-ch'in during the successful defense of Chihchiang in 1945.